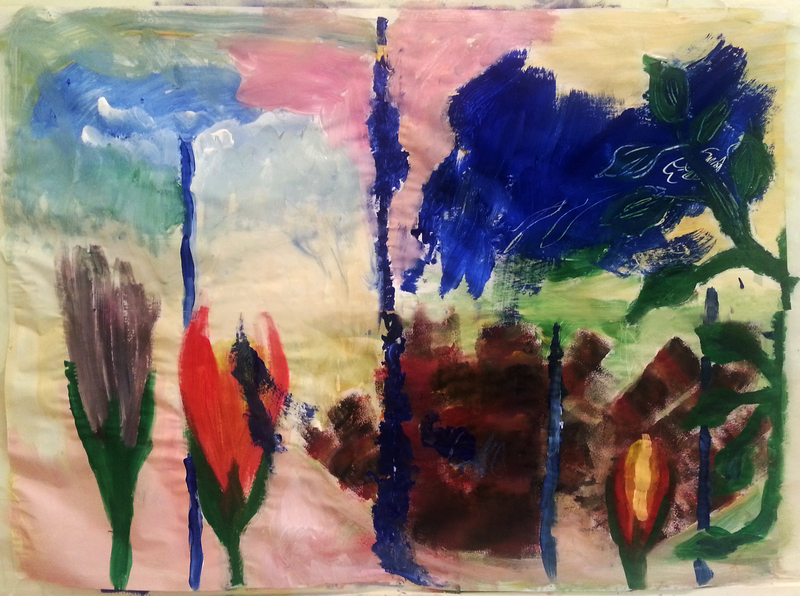 My three and a half year old and I just finished a painting that we had started yesterday. The light and dark blue clouds, the brown explosion in the background and the blue vertical line in the middle are all his. There was some negotiation towards the end. He wanted to paint over the whole image with blue paint but by that time I had already fallen in love with what we had done. So we negotiated a compromise which was that he painted over my leaves and then we both then used the end of our paint brushes to scrape the leaves back into the painting. 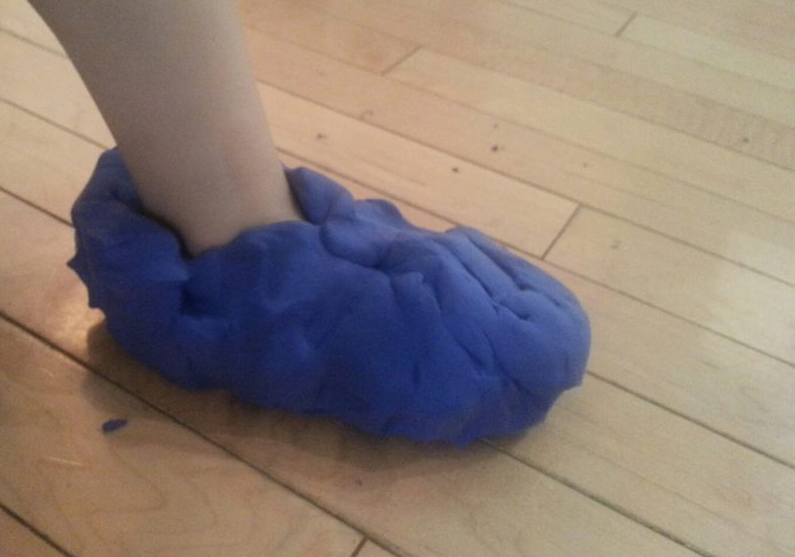 Later that day my son made himself some clay shoes. He came running around the comer into the kitchen wearing them saying “Mama I made myself slippers”. We tried to make me a pair but alas there was not enough clay. I have been reading the book Play: How it Shapes the Brain, Opens the Imagination and Invigorates the Soul, by author Stuart Brown. In Chapter One, he tells the story of how Jet Propulsion Laboratory (JPL), a premier aerospace research facility, discovered the importance of hands-on creative play. After a crop of older engineers retired, JPL hired top graduates from top engineering schools as replacements. But they discovered that this new group of engineers were lacking in a certain type of problem solving that was critical to their job. While they could grapple with complex mathematical theories, they lacked the innovative thinking that was needed to build aerospace robots that needed to adapt to different conditions. JPL wanted to find out what they needed to look for during their hiring process that would ensure they only hired innovative engineers. After doing some research and talking with their retired engineers, they discovered the difference between the two groups. The older engineers, when growing up, had made soap box derby racing cars, created hi-fi stereos, and fixed appliances, while the younger engineers had done none of this type of creative hands-on-play. JPL came to the conclusion that engineers who worked and played with their hands as they were growing up were able to see unique solutions, while those that had not worked with their hands could not. In their hiring process JPL began to include questions about youthful projects and play. As a parent reading this, I realised how important it is to provide my son with creative hands-on-play. My next question was: what was the best way to offer him these types of opportunities? My son is only three so I am not going to let him dismantle and rebuild our coffee-maker just yet. The answer came with an old box of LEGO that my mother-in-law found in her basement. My husband, my son and I are now deeply engaged in creative LEGO play. I am not referring to buying a LEGO kit and following the directions exactly. While building models with a step-by-step guide can be fun, I do not think it fosters creative problem solving. I do believe that building something from LEGO that no one has ever seen before does. This brings me to my project of building a LEGO fire station with my son. It combines two of my favorite things: re-using old objects and creative play. 2) EXTRACT OLD LEGO. Approach old LEGO boxes with care. The box my mother-in-law found disintegrated upon touch because the plastic box was so old. 3) WASH OLD LEGO. Your Old-LEGO might look very dirty and even might be moldy. Put Old-LEGO into washing machine with some Oxi- Clean and let soak overnight. 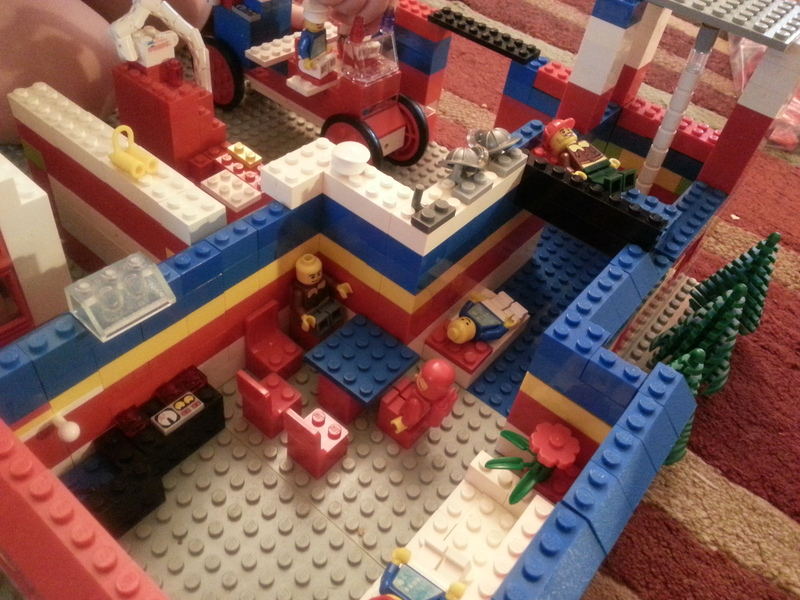 Then put LEGO through a wash on the delicate cycle (no spin dry) and lay out on towels to dry. 4) RESIST NEW LEGO. This is a tough one. 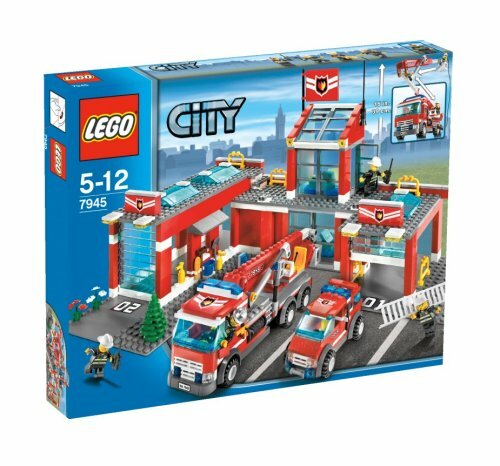 For instance, when my son and I were recently in a LEGO store I was pining for the $150.00 fancy NEW LEGO fire station. I had to keep telling myself that our OLD LEGO would make a fine fire station. Please notice detail of fire hat storage, high enough up that monsters can’t steal the hats. Also detail of the space in the truck, inbetween the seats, for the fire-fighter’s juice glasses. And finally the fire truck that my son built all on his own (the smaller one next to the ladder). 1) Yes you really can wash LEGO in your washing machine. 2) Reusing/recycling rather than buying new helps reduce landfill and saves you money. 3) Creating something unique with your hands can be fun and help young ones develop creative problem solving abilities. My one word of caution is that this project may distract you from your everyday activities. 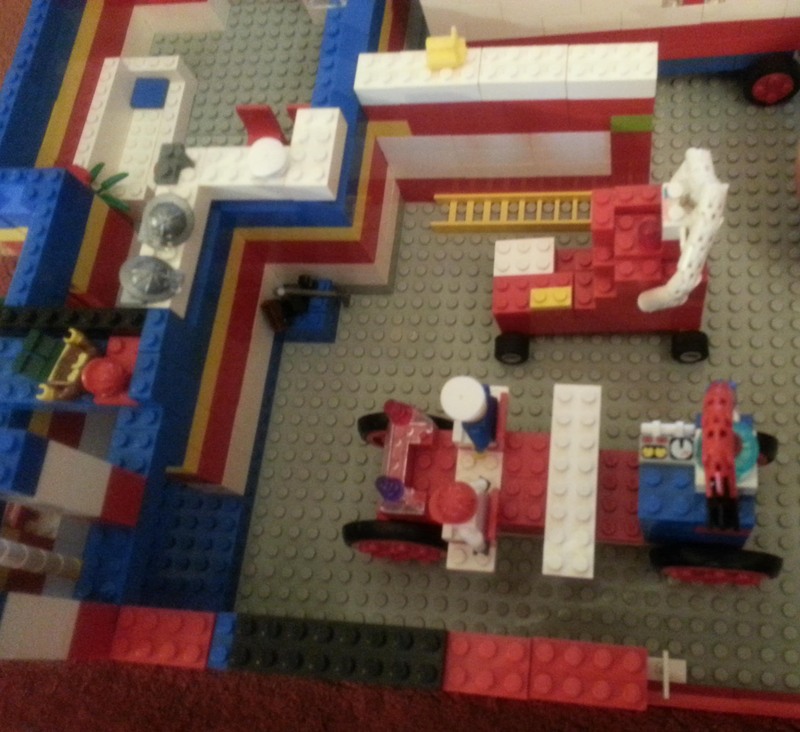 I had so much fun building our LEGO fire station that I totally lost track of time. I ended up leaving only fifteen minutes to get my son and myself dressed and ready to leave to go meet a friend. Anyone who has ever been around a toddler knows that is an almost impossible feat! 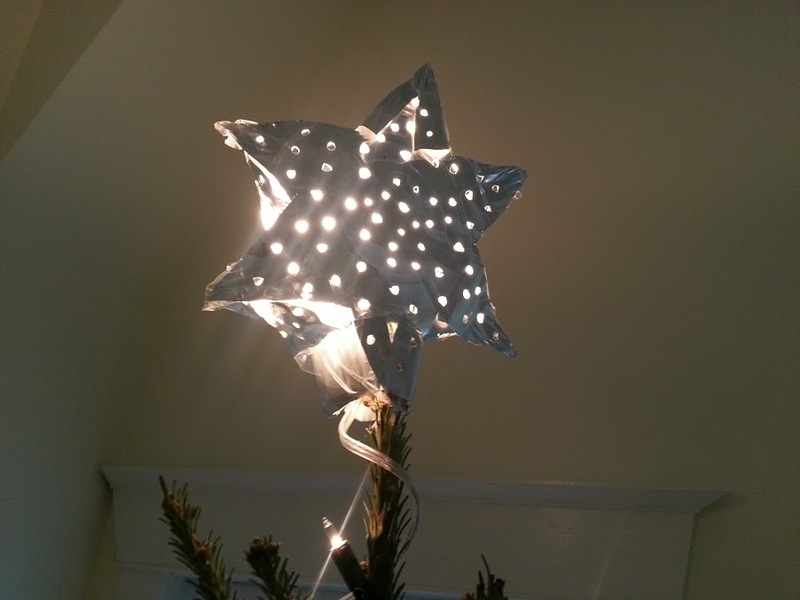 This year our holiday star from previous year was broken so I got three pie plates and I made this. It took about half an hour. It felt so good the make something rather that run to the store and be a consumer. My three year old son “helped” by sitting by my side and cutting up little piece of tin. We made a beautiful thing with our hands from recycled objects and found joy in doing so.